Authored by: Timothy Kusky, Ph.D. The two-volume Encyclopedia of Earth and Space Science is the perfect complement to the material typically taught in high school and college Earth science and astronomy classes. 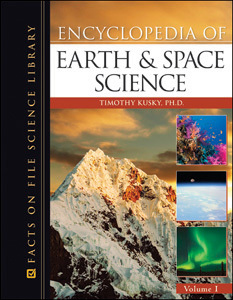 Based on the NSES Content Standards, this comprehensive reference emphasizes the physical processes involved in the formation and evolution of the Earth and universe, describes many examples of different types of geological and astrophysical phenomena, provides historical perspectives, and gives insight into the process of scientific inquiry by incorporating biographical profiles of people who have contributed significantly to the development of the sciences. The big bang theory is presented along with an evaluation of its physical principles and fundamental laws. The resulting structure of the universe, galaxies, solar system, planets, and places on Earth are also discussed. This informative resource boasts full-color photographs and illustrations, as well as an index, appendixes, cross-references, and a chronology. "This is an informative resource that displays the Earth's wonder. It will appeal to an audience of high school and college Earth science and astronomy classes. Highly recommended for both academic and public libraries." "...well designed to meet the user's needs...Recommended."